The Marbled Godwit is a large shorebird with a long, slightly upturned bill. During Godwit Days, they are in Humboldt Bay by the thousands, before they head off to their nesting grounds in the central U.S. and Canadian prairies. Marbled Godwits winter on the Pacific Coast and a distinct population (the slightly smaller subspecies beringiae) winters predominately at the Arcata Marsh & Wildlife Sanctuary and on Humboldt Bay. The City of Arcata started the Godwit Days Spring Migration Bird Festival, twenty years ago, to promote the diversity of bird species at the Arcata Marsh and Wildlife Sanctuary while creating an eco-tourism niche. The Arcata Marsh system was developed as a way to reclaim lost wetlands and to treat Arcata’s sewage using tertiary treatment. It now provides a resting spot and home to over 300 bird species and migratory visitors. As the festival grew out of City Hall, it became a 501C3 with a board of directors possessing expertise in natural resource management, wildlife biology, wetlands preservation, organization and economic development. The non-profit has expanded to oversee additional yearly events including, Birding on the Madaket held in August and the Godwit Days Fall Preview now held the last weekend in September. Through our sponsors, volunteers, vendors and registrants, the Godwit Days festival continues to grow and provide our visitors and community friends a fun, educational eco-tour event. To learn more about these events, go to our All About Events page. Godwit Days promotes quality birding and environmental education in Humboldt County’s rich ecosystem for the enjoyment of the community and visitors by hosting an annual festival and year-round birding events. Probably the easiest way to understand how our site is organized is by reviewing the Site Map. As the site changes, the map is updated automatically. 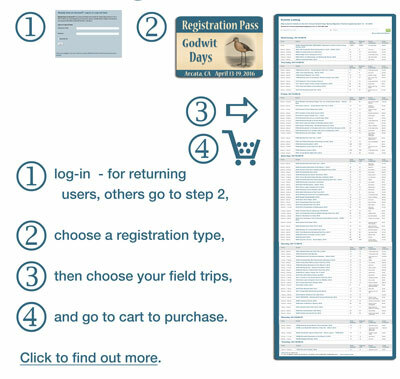 If your visiting in order to attend events sponsored by Godwit Days, there is one menu tab that explains our festivals, a page that lists all events scheduled, arranged by date; and, others that are organized by categories, such as location. From these pages, you can book your event and pay though our secure gateway.